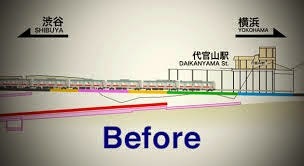 Daikanyama is a little know but delightful Greenwich Village type district of Tokyo nestled between Shibuya and Ebisu. It's home to the Hacienda where the finest margaritas can be found, Tableaux where Eddie, star of A-Team, Dallas and Knots Landing, would entertain as the finest mantra d' in town and referred to in "Lost in Translation" as having a great sushi bar, though I somewhat question whether anyone in their first days in Tokyo would actually know about it. It's also home to a small train station which on 15 March 2013 had to move. The end of the line was Shibuya where the station was being relocated to the new (though fairly unloved) Hikarie building, 100m away and several levels underground. 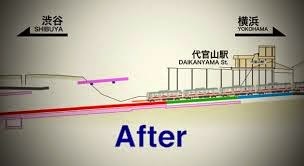 This meant that the tracks at Daikanyama would be coming from much deeper than before and would no longer intersect at ground level. The choice was to lower the station or build new tracks. They opted to build new tracks. Just before 1.00am the final train passed through. And then 1,200 people set to work in a co-ordinated ballet lasting a little over four hours to change an entire train line linking Tokyo to Yokohama. And at just after 5.00am the first train arrived dead on time. And here's a video of it happening. Seriously, only in Japan.